Rainforests play an integral role in the Earth’s survival -- more than 20 percent of the world’s oxygen is produced in the Amazon rainforest alone, and more than half of the world’s estimated 10 million species of plants, animals and insects inhabit tropical rainforests around the globe. Reptiles, snakes especially, make up a large number of rainforest species. From the giant anaconda to multi-colored tree snakes, reptile diversity within the rainforest biome is high compared to other ecosystems. The majority of snakes that inhabit rainforests are non-venomous; however, several species inflict deadly venom with each bite. Africa’s Congo rainforest hosts a variety of venomous snakes like the black and green mambas (Dendroaspis polylepsis and angusticeps), as well as the Gaboon viper (Bitis gabonica) -- the largest, heaviest viper in the world. Many species of cobra, including the king cobra (Ophiophagus hannah), inhabit Asian rainforests, while the Amazon rainforest in South America contains coral snakes and the fer-de-lance (Bothrops asper). Australian rainforests are home to taipans; the coastal taipan (Oxyuranus scutellatus) has the third most toxic venom of any land snake. Pythons are constrictors; they kill their prey by wrapping their strong bodies around it and suffocating it to death. Most python species are excellent climbers and swimmers -- perfect for the arboreal, river-laced rainforest environment. One of the most famous rainforest pythons is the large reticulated python of Asian rainforests (Python reticulatus). These ambush-style hunters can grow to weigh 350 pounds. Other notable rainforest pythons include Burmese pythons (Python molurus bivattatus), African rock pythons (Python sebae) and blood pythons (Python curtus). Boas are similar to pythons: they both love to climb, swim and suffocate their prey. What separates boas from pythons is their reproductive process. 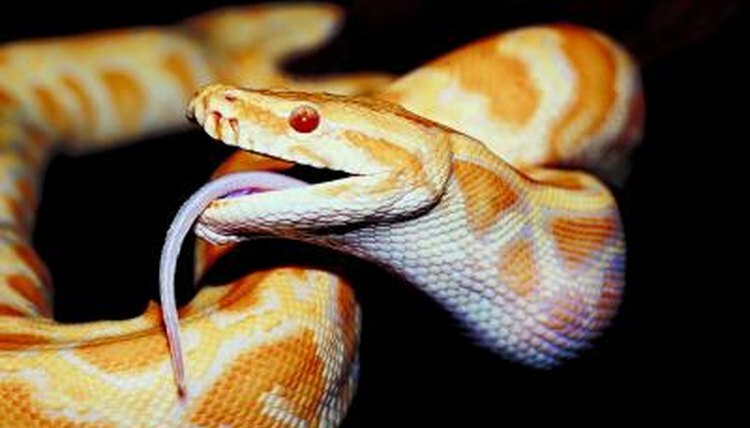 Boas give birth to live young whereas pythons lay eggs. Perhaps the most well-known and feared rainforest boa is the Amazon’s massive green anaconda (Eunectes murinus). This species is thicker and heavier than any python, earning it the title of “world’s largest snake.” Green anacondas are known to feast on almost anything they can grab from wild pigs to capybaras and birds. The Amazon is also home to a variety of boas such as the Amazon tree boa (Corallus hortulanus) and the more docile common boa constrictors also found in Brazil, Columbia, Guyana, Surinam and Mexico. Tree snakes are often smaller, faster and more colorful than their ground-dwelling counterparts. The green tree snake (Dendrelaphis punctulata) is a bright blue, green and yellow snake that lives in the northern tropics and eastern Australian rainforests. Brown tree snakes (Boiga irregularis) are another species found in Australian rainforests and woodlands, but unlike their green cousins, these snakes inflict a venomous bite. Tree snakes eat mostly birds and small mammals but sometimes consume lizards and juvenile snakes.